Waterfalls create magical, awe-inspiring scenes, and our national parks have some of the best. Visit Yosemite National Park during May and June when snow melt from the High Sierra Mountains begins to flow into streams and rivers. From nearly any location in Yosemite Valley you can see at least one magnificent waterfall—and possibly smaller transient waterfalls. Yosemite Falls, best-known and most spectacular in the park, is the highest waterfall in North America and sixth highest in the world. Measuring 2,425 feet from the top of the upper fall to the base of the lower fall, this two-tiered namesake attraction flows in a long, narrow stream of water that is especially forceful in late spring (by August it may be just a trickle). The final 320 foot drop--after a series of five smaller plunges in the Middle Cascades—makes up the Lower Fall. 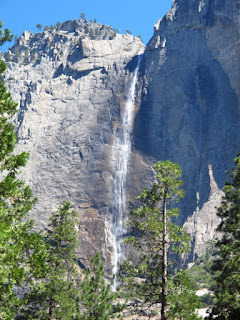 An easy one-mile Lower Yosemite Fall Loop Trail takes visitors to the base of the waterfall where there is an accessible viewing area with extraordinary views of the powerful waterfall. Trails from the valley floor lead to the top of Upper Yosemite Fall, but hikers should be prepared for a long, challenging climb. 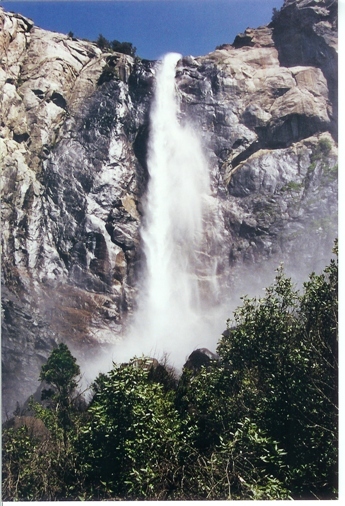 Another recognizable waterfall, and the first one most visitors to Yosemite National Park see when entering the valley via tunnels on Wawona Road, is Bridal Veil Falls. This waterfall is popular for two reasons: It flows all year (peaking in May); and a short but steep quarter-mile trek takes visitors to the base of the fall where they can get outstanding photos of this streaming, white cascade. Vernal and Nevada Falls are two extraordinary water plunges that can be seen close up on the popular (and often crowded) mile-and-a-half Mist Trail. As the name suggests, the rocky path is often wet from spray, which can make the hike slippery. But a trek to Vernal Falls, the first one on the trail, is entirely doable and provides a feast for the senses and breathtaking vistas that will remain etched in your mind forever. Mist rising from Lower Falls of the Yellowstone River forms a prism reflecting greens and golds in a surreal scene. A painting by Thomas Moran of this incredibly beautiful vision helped persuade Congress to make Yellowstone the world’s first national park. After the geyser Old Faithful, this is the most photographed spot in the park. Formed by erosion as the Yellowstone River flows over progressively softer, less resistant rock, the waterfall flows first over the 109-foot Upper Falls and then the more accessible Lower Falls. It is the biggest waterfall in Yellowstone and the most famous. Part of the reason is that it can be viewed from several different vantage points such as serene Artist Point where visitors can watch the water drop 308 feet into the mist below. A one-way loop drive from the east goes to the brink of the Grand Canyon of the Yellowstone River providing “wow” opportunities at Inspiration Point, Grandview Point, and Lookout Point. For a breathtaking experience, take a trail to the top of the Falls (the last stop), a short but steep three-quarters mile round trip. Hear the intense roar as water plunges deep into the rainbow mist beneath. Waterfalls are abundant when rafting on the Colorado River at the bottom of the Grand Canyon. In fact, drenching myself under a waterfall was an easy way to "shower" and get clean, especially since the river water was 45 degrees and muddy. Beguiling turquoise water flowing over crimson red rocks seems almost unearthly at HavasuFalls. But it’s not a dream, which you’ll fully realize after hiking 10 miles into Havasu Canyon to reach the falls. If you have an adventurous spirit, it’s definitely worth the effort to see an oasis of waterfalls in the desert southwest. One of the most photographed waterfalls in the world, Havasu’s 100 foot drop is impressive, but the most amazing feature is its breathtaking blue-green color, which is due to high mineral content of travertine in the water. Although located within the Grand Canyon, this tropical paradise is not in Grand Canyon National Park but rather on the Havasupai Indian Reservation. Because it’s private land hikers must obtain a trail permit from the reservation. Havasu is one of four major waterfalls (also Navajo, Mooney, and Beaver Falls) in the indigenous home of the Havasupai Indian tribe, who have lived there for over 800 years. Guided hiking tours are available, or helicopter rides take visitors over the canyon for a birds-eye view of the waterfalls.